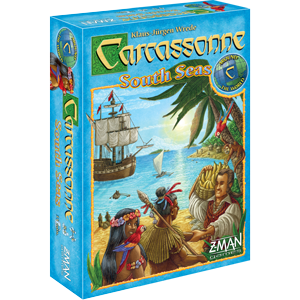 It’s a race down the Amazon in this tile-laying game inspired by Carcassonne. As you venture into the South American rainforest, river and jungle alike abound with colorful wildlife that create a spectacular panorama. But you have little time to appreciate the serenity of the moment: Others are heading into the wilderness to build camps and explore down the river. The race is on! 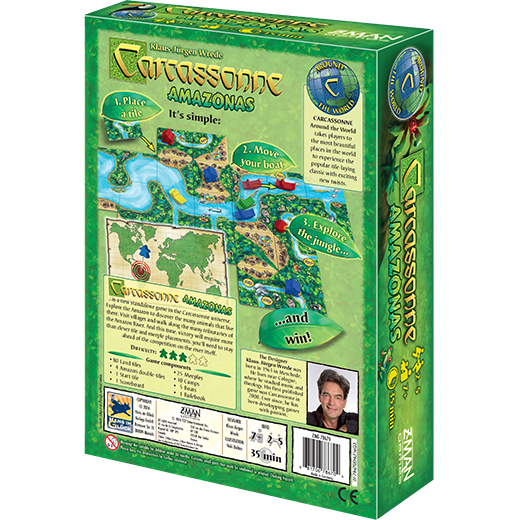 Carcassonne: Amazonas sends you on a journey down the Amazon as you fill in the river and surrounding areas, one tile at a time. Along the way, discover many wonderful secrets deep in the rainforest. 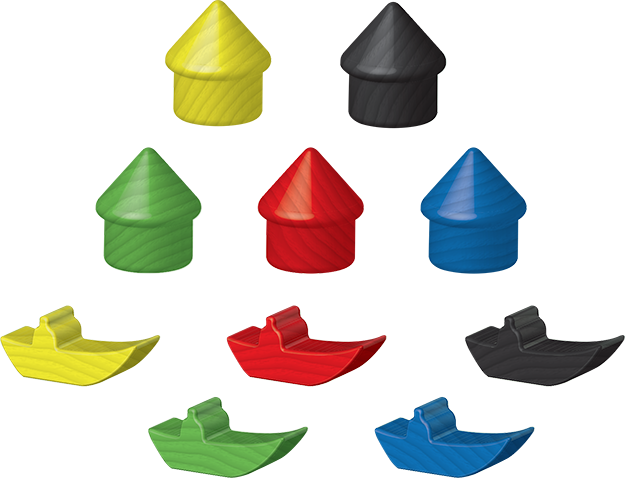 Ultimately, it is up to you to decide whether you want to place your meeples or camps on the features you discover, or if you want to forge ahead of the competition and push farther down the river. 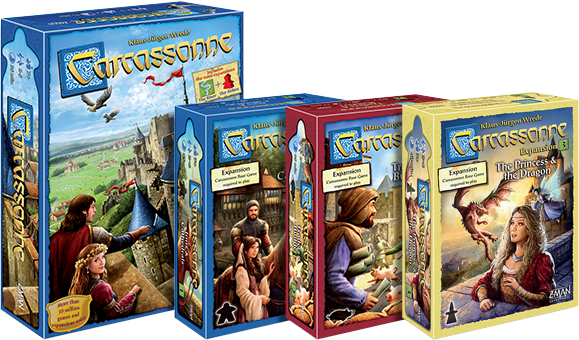 Whoever amasses the most points on their journey will be declared the winner! All sorts of things are waiting to be discovered in the jungle. 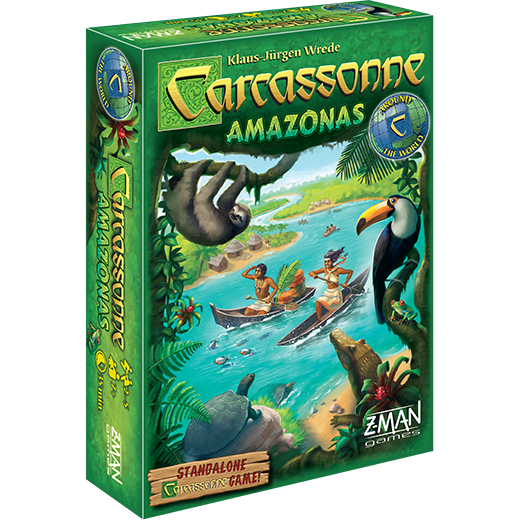 On your journey, you’ll come across many animals, visit villages, and walk along the many tributaries of the Amazon River. 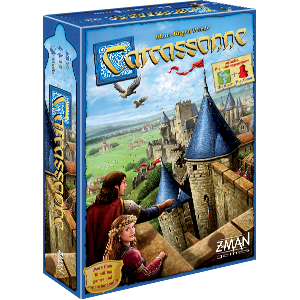 Just like in Carcassonne, you have the option to place meeples on these features as you discover them and score points once they’re completed. 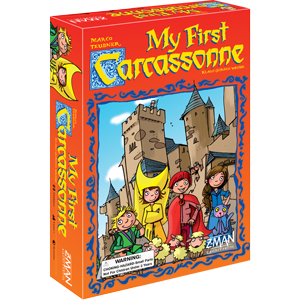 But with Carcassonne: Amazonas, it takes more than just cunning tile placement to win—it’s also a race down the Amazon River itself. When a tile is added to the river, the player whose boat is farthest down the river scores points equal to the number of piranhas and caimans that appear on that tile. 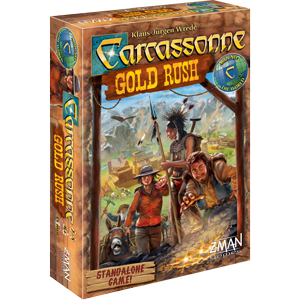 To become a legendary explorer, you'll need to strike the right balance between placing your meeples and camps and staying ahead of the competition!